Atlantans usually prefer knowing if they're someplace where a crime is about to happen, even if it's just an early warning from our own Cee Lo that he would bring Gwyneth Paltrow out to sing at the Grammys. 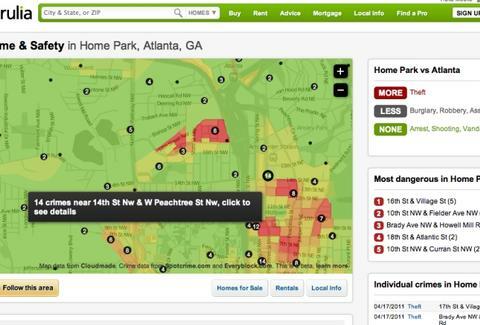 To avoid the type of offenses you encounter outside your crib, use Trulia Crime Maps. A sometimes-terrifying yet somehow always-fun interactive service outta San Fran (gangsta! ), TCM hits residents of ATL and other US metropolises with constantly updated stats on crimes that're happening in their very hoods, leading many to switch to crewneck sweatshirts. Type in any address and it'll instantly calculate the number of reported crimes anywhere in town; then, use the Heatmap scale for a color-coded overview of total incidents-per-year (from green meaning none, to 60+ red), and check bar graph measurements for a weekly idea of crime trends, presumably stuff like slim-fitting president masks and demanding the unmarked bills be put in locally made sustainable gym bags. You can also filter 10 categories of illegality to find out where in ATL you're most likely to be robbed (West End), assaulted (Joseph E. Boone), or live among drug dealers (Techwood! ), then see the five crime-iest cross streets, with the current #1 being MLK & Capitol, where last month there were 107 incidents including the stealing of a flash drive from a GSU student, which paradoxically doesn't happen when your head is in the cloud. You can get further descriptions for each act of hooliganism by clicking on crime spot dots, which lead to a page where you can leave or read comments from other users -- a great way to give the community a voice, even if they just use it to complain together about Gwyneth's.